Put your hands behind your head but don't interlock your fingers. Use your abdominals to pull your shoulders up. Also, push your chin down as though to squeeze an orange between your chin and your chest to stabilize your neck. Have someone hold your feet as you move forward and perform this ball exercise with the ball under your pelvis. There are a lot of websites out there to tell you how to perform abdominal crunches. 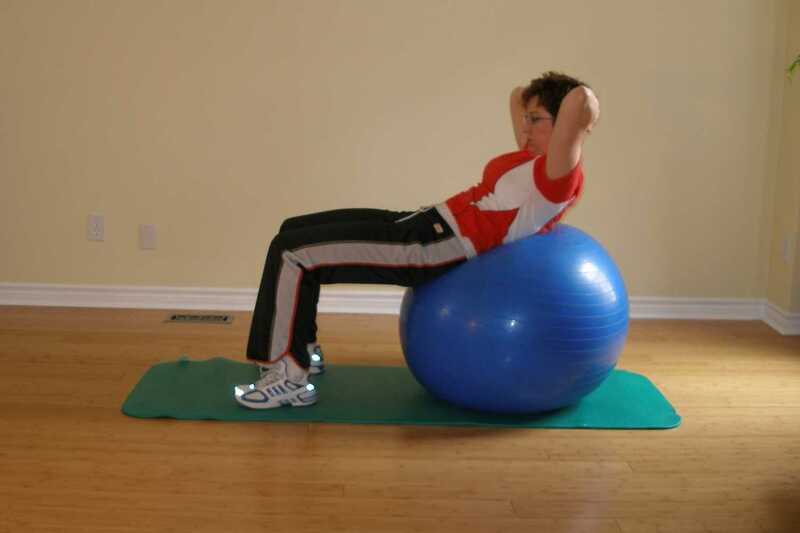 This version over the exercise ball allows you to work your abdominal muscles through a larger range of motion than on the floor. Putting your arms over your head shifts your mass over the ball forcing your abdominal muscles to work harder.